Q. How do I book a home? A. You can either request a booking directly on this website by using our Contact Us page or please call our office at (800) 791.8366 and a reservation manager will be glad to help. A. Yes we do. We take Visa and Master Card. We do not take American Express. A 4% service charge will apply for all payments by credit card. A. Anytime after 4:00 pm PST. Unless previously agreed upon with Vacation Concierge, Inc. please do not check in early. Our cleaning service may be preparing for your stay from a check out that morning so please be kind and check in anytime after 4:00 pm. A. Before 10:00 am. PST. We may have a back to back reservation so please be kind to our cleaning service and check out on or by 10:00 so that we can prepare the rental for the next guest. Q. How do I get to the rental? A. Upon full payment of the rental agreement arrival instructions and directions will be sent for your use. Please print them and bring a copy in your purse or billfold for easy reference. A. If the reservation is made 60 days or longer from the check in date then the deposit with a signed agreement is due ASAP to secure the reservation. The remaining payments are noted in the rental agreement. If the reservation is less than 30 days from the check in date then the entire amount is due ASAP to secure the reservation. Q. What are some of the fees I can expect when renting a vacation rental. A. The following applies to all rentals: Rent, pet fee (if applicable), lodging tax (if your stay is less than a month – Laguna Niguel rentals are excluded), $500 refundable deposit, and either a damage protection deposit of $3,000 or accidental damage insurance for $45 to cover up to $3,000 in protection deducted from the $500 refundable deposit. Please contact us for more information about fees at a specific rental property. Q. Are the vacation rentals child friendly? A. Each rental is unique and some properties may be a better fit for your family than others. The number and ages of your children will help us direct you to the property that is best for you and your family. A. Some of our properties allow pets. Please be sure to review each properties amenities to see if a property is pet friendly or please call us to inquiry about a specific property. Q. What are the benefits of renting a Vacation Concierge, Inc. Vacation Rentals? A. At Vacation Concierge, Inc. we only manage quality properties that are newly remodeled and nicely furnished. We want you to feel right at home the moment you walk in the door. Each rental is fully outfitted with flat screen televisions, private laundry beach toys, fully outfitted kitchens including cooking utensils, dishes, and glassware. Our friendly staff is interested in making sure everything is just right for your stay. If there is something that we can do to make your stay better please call our office and we will make every effort to fulfill your request. Q. In what locations do you have properties? A. 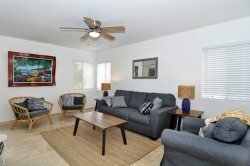 Currently we have vacation rentals in many cities along the Southern California Coast, including Laguna Beach, Laguna Niguel, Dana Point, and San Clemente. A. In the event of a cancellation, please notify VC as soon as possible. If you cancel more than 60 days before check-in, your deposit will be returned. If you cancel less than 60 days before check-in, you will forfeit your deposit. If you cancel less than 30 days before check-in, you will forfeit full payment. After the first day of the rental, there will be no refunds for any reason. No cancellations due to weather. To protect your vacation investment we recommend opting for the Travel Protection and Damage Insurance by Travel Guard as noted in the rental agreement. This insurance protects your vacation rental investment for many reasons including illness, death, travel delays and more. Ask your reservationist about this protection today. Q: I cannot find an answer to my question! A: If you were not able to find an answer on our website, please contact us directly and we will get back to you as soon as we can. Visit our Contact Us page to fill out a quick form, or call us at 800.791.8366. Please leave a message and we will get back to you in the morning. Thank you for your interest.